The biggest and most notorious underground rock and hip hop festival, Strange Noize, has returned as 2010’s hottest summer ticket. 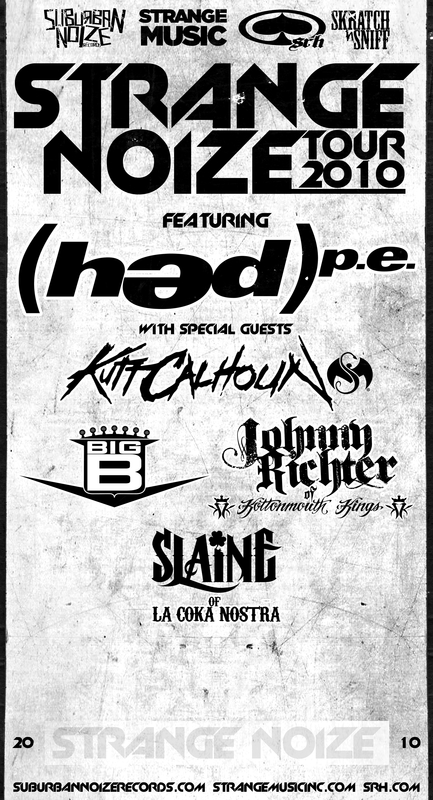 This year’s festival will feature (Hed)p.e, along with Strange Music’s Kutt Calhoun, Big B, Johnny Richter of the Kottonmouth Kings, and Slaine of La Coka Nostra. The Strange Noize music festival debuted in 2007 and quickly became one of the summer’s hottest tickets. The tour united two of America’s biggest independent record labels, Suburban Noize and Strange Music, for one summer music festival that sold out over 40 dates across the country. The tour was a powerful message to the music industry that underground music could infiltrate the masses on a large scale and could no longer be ignored. (Hed)p.e’s latest studio album, New World Orphans, has sent tremors through the underground and led to tours with Tech N9ne, Insane Clown Posse, and theatrical metal-outfit Mushroomhead. The group is preparing for the release of Major Pain 2 Indee Freedom – The Best of (Hed)p.e, a career-spanning collection of the classic songs that have made the group an underground force for over 13 years. The album, which lands in stores on June 22nd, includes a DVD that captures the band’s legendary live show in surround sound, along with their music videos and never before seen behind- the-scenes footage. 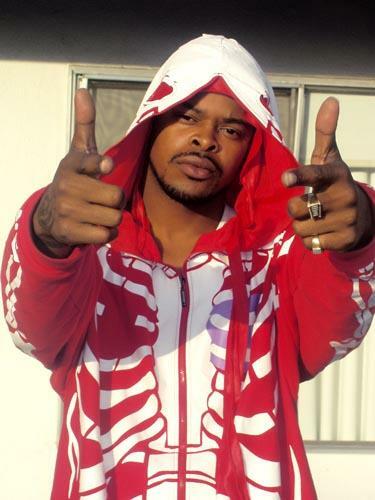 Kutt Calhoun positions himself front and center with his newest release, Raw & Un-Kutt . As the follow up to his 2008 release Feature Presentation , Kutt brings his straight-forward, street-conscious sound to the table with Raw & Un-Kutt , yet still maintains his girl-crazy, party sensibilities. Kutt Calhoun, longtime labelmate of Tech N9ne, brings you an album that is truly Kutt–with a flow that’s both rhythmic and melodic, while grabbing listeners by the ears and pulling them into his world. With tracks like “Naked (Boom Boom Room)”, “Get Kutt”, “Redemption”, “Hey Hey Hey (Raw And Un-Kutt)”, and “Flip Cam”, along with guest apperances from Tech N9ne, Brotha Lynch Hung, Joe Budden, E-40, Too Short and more, Raw & Un-Kutt will definitely be an album to keep in constant rotation. Big B has just finished recording his fifth studio album, Good Times & Bad Advice, with producer Jim Perkins (Dumbluck, OPM). The album is the next step in Big B’s growing musical evolution as he mixes elements of rock and hip hop, along with his trademark laid-back acoustics, to create a sound that embodies his feel-good lifestyle. The album is slated to feature guest appearances by Everlast, Pepper, Unwritten Law’s Scott Russo, Glasses Malone and Cisco Adler. As co-emcee of one of the underground’s hottest groups for the past decade, the Kottonmouth Kings Johnny Richter is ready to steal the spotlight with the release of his first ever solo album, Laughing, on July 6th. The album is an audio autobiography for one the most captivating rappers in the underground and blurs the lines between hip-hop and rock. La Coka Nostra frontman Slaine has been grinding his way throughout the underground hip-hop since 2001, when he cutting a demo in a studio operated by the Lordz of Brooklyn. Since then Slaine has been traveling the world performing for his growing fan base, and working with hip-hop icons such as DJ Premier, House of Pain, Cypress Hill, and The Alchemist. Slaine is currently touring in support of A Brand You Can Trust, the debut album from hip-hop supergroup La Coka Nostra.